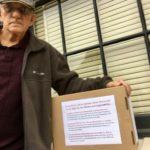 Disabled retired miner Carl Shoupe prepares to deliver a message to Sen. McConnell. 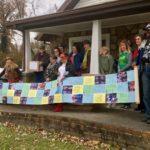 Black lung advocates hold a "quilt" honoring those with the disease. Black lung advocates hold a “quilt” honoring those with the disease. Some people quietly rehearsed what they hoped to say; others brought written statements to read to the senator’s staff. Another resident, Morgan Brown, said she was visiting McConnell’s office on behalf of her father, a retired coal miner suffering from black lung. Brown said her father worked for different coal companies across the state. Now he struggles with the disease and fights to get benefits from the industry. Brown’s father is seeking benefits from a company he worked for. But more than 25,000 miners and their dependents rely on the federal trust fund for benefits because a responsible employer cannot be identified. An excise tax on each ton of coal mined supports the fund, but early in the fund’s operation it slid deep into debt. Congress roughly doubled the coal tax in 1981, and renewed that rate ten years ago. That rate expires at the end of the year, which would send the tax back to its 1980 level. That would save money for the mining industry but would likely sending the fund’s debt spiraling billions of dollars higher unless Congress acts to extend the existing tax rate. Retired miner Carl Shoupe said if anyone can get Congress to act, it’s his state’s senior senator. The fate of the trust fund is unfolding amid an epidemic surge in cases of black lung disease among Appalachian miners and a sharp downturn in the region’s mining industry. That leaves McConnell in an uncomfortable position that pits the interests of powerful home-state mining companies against those sickened by work in that industry. As Majority Leader, Sen. McConnell could find a way to extend the tax. During an October event in eastern Kentucky he appeared to indicate he would do that. “That’ll be taken care of before we get into an expiration situation,” McConnell said in response to a ReSource reporter’s question about the status of the trust fund and the coal tax. “It just won’t be allowed to be unfunded,” McConnell reiterated. But with less than a week remaining in the Congressional session, black lung advocates are still waiting for McConnell to follow through on that, and McConnell’s staff appears to be softening the senator’s earlier statement. As the ReSource reported in June, a report from the Government Accountability Office estimates that a reduced coal tax would likely add billions to the already sizable debt for the trust fund. In one scenario, the GAO estimates a $15 billion debt for the fund by 2050. That would not immediately put miners’ benefits in jeopardy. In the past the federal government has forgiven the fund’s debt. But advocates say a large debt raises the possibility of reduced benefits down the road or greater barriers for future applicants to win benefits. And they raise questions about the fairness of having taxpayers, rather than the industry, paying off the fund’s debt. The United Mine Workers of America, the union representing miners, argues that allowing the coal tax rate to expire would shift the burden for black lung benefits from the industry to the public. The coal mining industry has been arguing behind the scenes in Washington and in regional opinion pages that the coal tax at its current rate is “an unfair burden” and should be allowed to expire. Kentucky Coal Association President Tyler White said that would not mean the tax is going away, rather it would go back to the level Congress originally intended. White said that would hurt the coal industry’s ability to remain viable which, in turn, could put the trust fund in jeopardy if there is no coal production to be taxed. Congress has reason to listen when the coal industry speaks. Coal mining companies and their political action committees doled out more than $20 million in political spending in the last two election cycles, according to an analysis of campaign finance records by the nonprofit Center for Responsive Politics. About 95 percent of campaign contributions went to Republicans and some of the top contributing companies have a major presence in the Ohio Valley, including Alliance Resource Partners and Murray Energy. The mining industry’s aggressive lobbying appears to be paying off. For example, a draft version of a House tax bill had included a modest, one-year extension of the current excise tax rate on coal for the trust fund. Then in late November the National Mining Association sent members of Congress a letter urging them to remove that section from the bill. The letter from NMA President Hal Quinn also warned that if the provision was not removed NMA “will include this floor vote in its Congressional Scorecard” as a negative mark against lawmakers. When House Republicans released a new version of the bill in December, the coal tax rate extension was gone. “Well it just shows you how responsive Congress can be to lobbyists from an industry that’s on its decline,” said Wes Addington, Deputy Director of the nonprofit Appalachian Citizens’ Law Center. Addington is the son of a miner and the law center operates in Whitesburg, deep in eastern Kentucky’s coal country, where staffers work on black lung benefits and other mining community issues. He noted that the trust fund has been especially important for Appalachian mining communities because of the region’s long history of mining and frequent problems identifying a company to take responsibility for a sick miners’ benefits. Department of Labor figures support that. From 2009 to 2018, Kentucky, Ohio and West Virginia have been responsible for 63 percent of all black lung benefit claims the department received. In that time residents of the three states have relied on over $1.3 billion to from the fund to help pay for medical and other life expenses brought about by black lung disease. With just days left before Congress is scheduled to adjourn, the Kentucky black lung advocates weren’t ready to give up. They were planning one more visit to McConnell’s regional office. ReSource staff Alexandra Kanik and Jeff Young contributed reporting.